President Francois Hollande led ceremonies Sunday marking the 70th anniversary of the largest roundup of Jews in World War II France, and promised to crackdown on anti-Semitism in a country reeling from killings at a Jewish school in March. Some 13,000 Jews were deported by French police on July 16 and 17, 1942, many of whom were first holed up in harsh conditions at Paris' Vel d'Hiv, or the Winter Velodrome stadium. Thousands of men, women and children were eventually taken to the Nazi's Auschwitz death camp, where they were killed. Speaking from the site of the former stadium near the Eiffel Tower, Hollande told a gathering, which included Jewish leaders, that the crime "was committed in France by France." 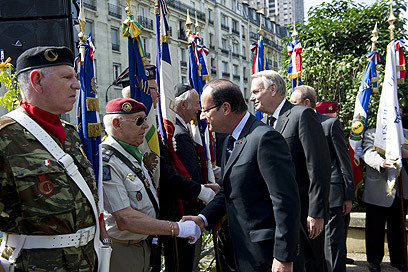 "Not one German soldier, not one was mobilized during this entire operation," Hollande said. Hollande invoked the memory of a killing of three Jewish schoolchildren and a rabbi in the southern French city of Toulouse in March. "Four months ago ... children died for the same reason as those in the Vel d'Hiv — because they were Jewish," said Hollande. He said the security of the Jewish community is the business of the whole country. Hollande paid tribute to the "courage" of Jacques Chirac — the last French president to lead a ceremony there in 1995 — who, for the first time, acknowledged the state's role in Jewish persecution. See all talkbacks "Hollande compares Toulouse attacks to Holocaust"